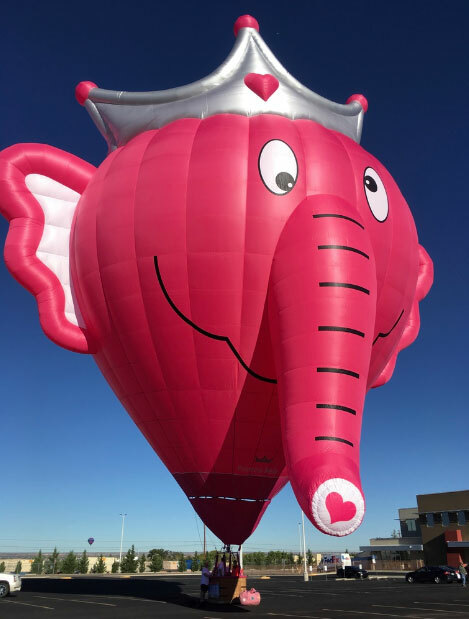 Within minutes, a runner is summoned and I am briskly escorted through the crowded throng of onlookers to the Princess Nelly pink elephant balloon and her crew. 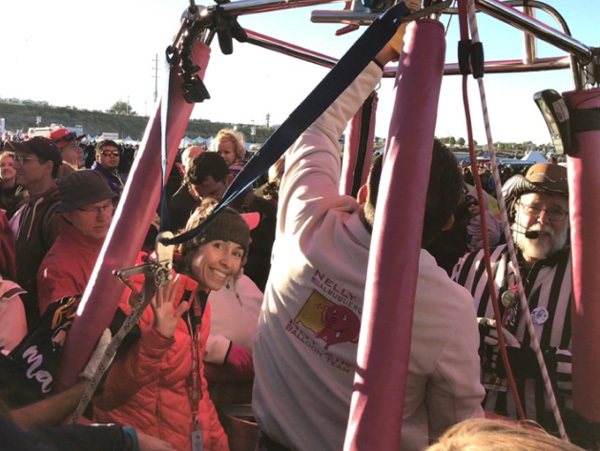 I’m briefed on the safety measures (don’t pull this cord, stay inside the basket, no smoking…) and told to remain nearby while Nelly is prepped to fly for her maiden voyage ever. Meanwhile, the sky has transitioned from inky black with only the twinkle glow from the dawn patrol balloons to a bright baby blue. The cloudless sky feels conspicuously clear as if it has cleaned house for this very moment and is standing poised and ready to welcome the balloons in a warm embrace. 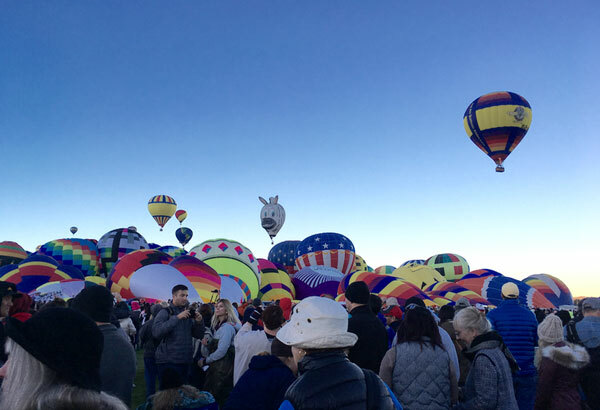 As if on cue, the hum of large, circular fans begin to fill the air as hundreds of balloon crews hasten to the task of filling their envelopes. In every direction, colorful sleeping giants are slowly rising from the ground. 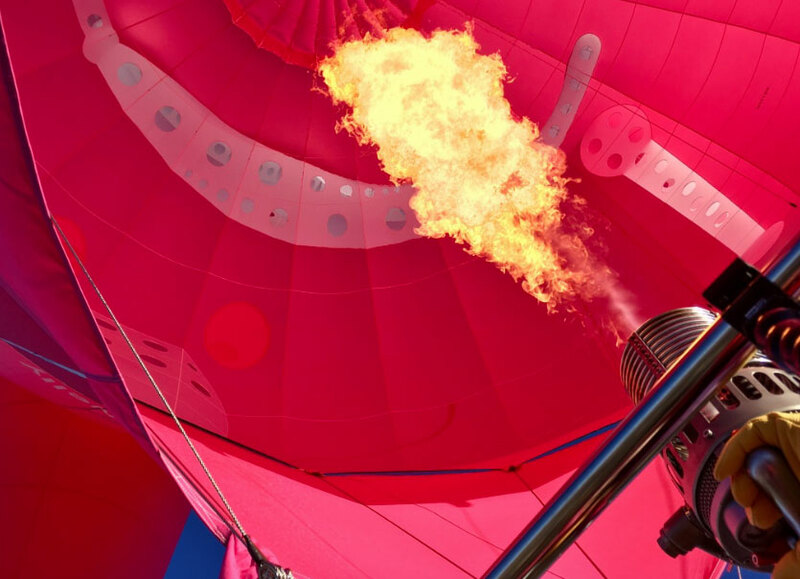 As the balloons take shape, the pulsing flames of nearby burners begin to warm the crisp air. It’s a wonder to behold, this swelling scenery rising up around us. With upturned faces, our gaze sweeps the horizon taking in the colorful cascade of shape and sound. I’m mentally exhausting my memory reserves in an attempt to capture and record the details of this moment. When Princess Nelly is fully inflated, I am invited to enter her gondola. Stepping gingerly inside the basket, I take my place beside my Belgian pilot and co-pilot. These two men, dressed sharply in crisp white button down shirts and matching pink ties, warmly welcome me aboard. Pronouncing my Dutch last name with pure perfection, I know I am in good company. Within minutes, the buoyancy of the balloon reaches the desired level and the crew releases their hold on the support ropes. Nelly gently skips forward across the grass and the crowd parts, making way for our grand adventure to begin. As we gain altitude, those watching below erupt in spontaneous applause. It’s a magical moment. Lifting skyward, I’m warmed by the intense heat of the burner above and awed by the breathtaking scene unfolding beneath me. We are surrounded on every side by floating neighbors in the sky. When not employing the use of the burner to gain or maintain altitude, the ride is stealthily quiet. Humbly submissive to the prevailing winds, we glide southward. In an attempt to achieve the elusive balance of being fully present while also recording the memory, I begin a revolving routine of contemplative awe and active picture taking. 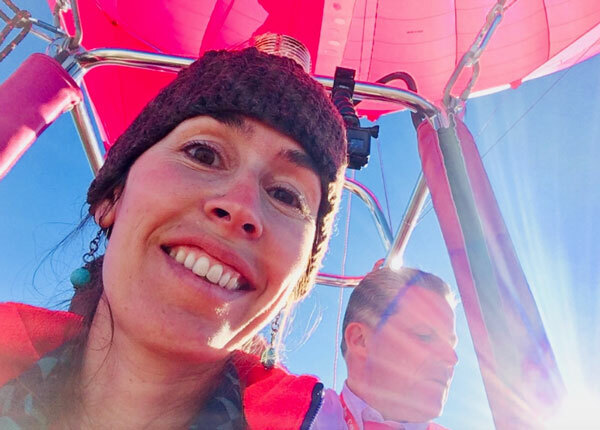 For the most part, I am left to my own silent thoughts as my basket buddies engage in a thick, ongoing, foreign dialogue which I guess to be closely tied to wind direction, altitude choices and landing options. I’m highly entertained when a paper map of Albuquerque is produced and I am asked if I know where a particular street is. Eventually the map is set aside and we skirt the lower altitude in search of an ideal landing zone. Any open space is up for grabs as we begin the descent dance—opening the vent, gliding downward, analyzing wind direction, employing the burner, and regaining altitude. It is here that I see how patience and a cool head are among a balloon pilot’s most valuable commodities. As our landing zone is selected and we hover toward our goal, I see cars rerouting below us, pulling over and watching with vested interest. In our little corner of town, we have become the main event and they have just earned a free backstage pass. I stand with bent knees, bracing for impact as Nelly gingerly touches down. Observers rush to offer assistance, draping themselves over the basket, anchoring us firmly. Their smiles reveal that this is no one-sided favor. “You’ve just made my daughters’ day, the pink elephant is her favorite!” says one man glancing behind him as his little girl stands mouth agape, eyes wide with wonder. The chase crew arrives moments later and Princess Nelly is prepped for travel. I step aside to watch them work. I am reunited with firm footing, yet my head is still dancing in the clouds. What a magnificent flight of faith a balloon pilot takes. From the moment we left the ground until we returned safely to it, every decision was dependent on understanding how to navigate through the constantly changing atmospheric conditions. Each balloon that launched that morning landed somewhere different depending on how they responded to their particular set of circumstances. It’s equal parts crazy and calculated that 500 balloons are able to dance through the same sky together with such beautiful unity. Having the opportunity to be out on the dance floor among them makes me feel like that little girl, mouth agape, eyes wide with wonder. 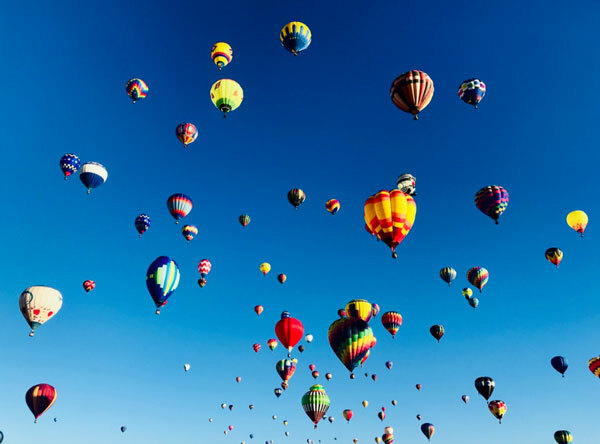 How about you, have you ever gone up in a hot air balloon? What was your impression? If you haven’t, would you want to? 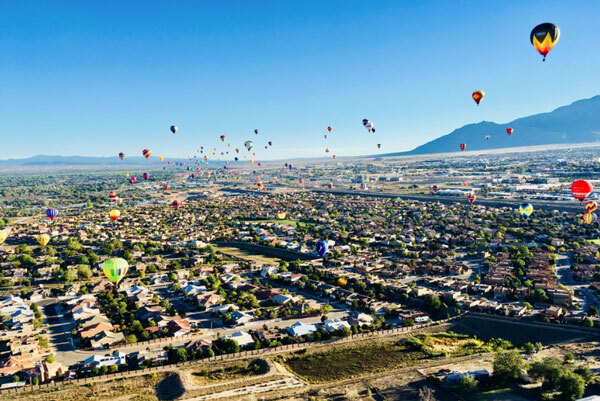 Have you ever visited the Albuquerque Balloon Fiesta or plan to in the future? Done in a pompously or overly solemn manner so as to impress: We are all here for the same portentous reason. -Length of stay info: We stayed a total of one week arriving three days before the Fiesta officially began. It was helpful to be there a few days prior as the crowds increase considerably as the event draws nearer. It is encouraged to plan to be at the event for a few days. This allows you a buffer in case the weather interferes with the balloons flying during some of the event days. I recommend planning to be present for at least one of the two weekends. The evening events (lit up tethered balloons and fireworks) are only during the weekends and are well worth it. A bonus for us was attending a Fulltime Families Hangout at the Fiesta. We were able to park next to other traveling families and take part in several fun pre-event activities. I believe this may even become an annual Fulltime Family event! 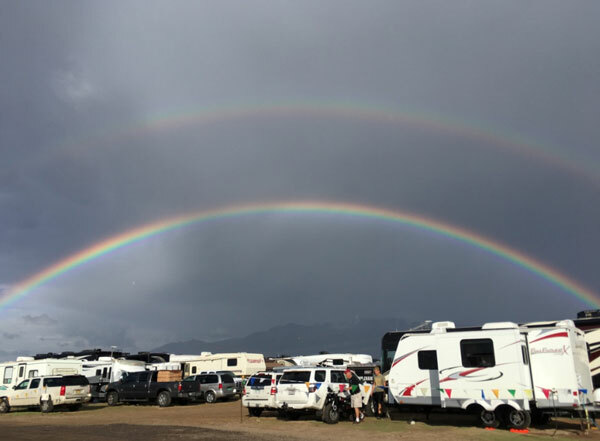 -RV site info: The cost we paid to boondock in a standard site was $35/night in a field about a mile and a half from the place where the balloons launch. Prior to the Fiesta the nightly rate is 1/2 off. There are also options for water and electric sites but they come at a premium price ($75/night). There are pump out services as well as water tank refill services offered for $25 each. 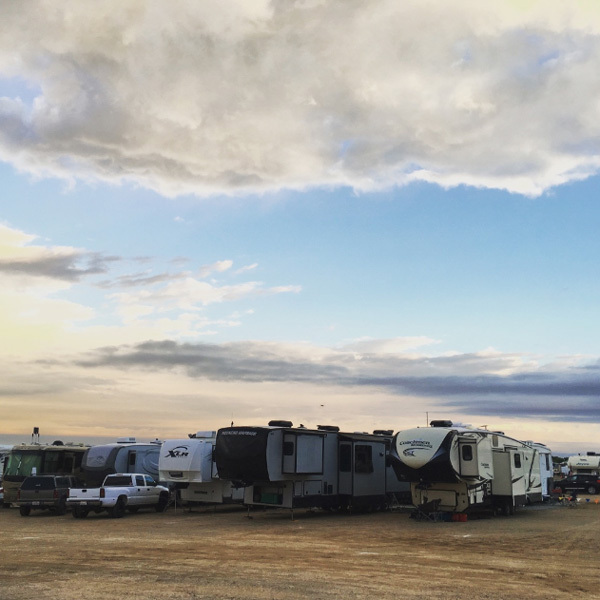 For more info on RV parking or reservations go here. -Transportation info: Free shuttles brought us to and from the field even delivering us to the exact row where our RV was parked. 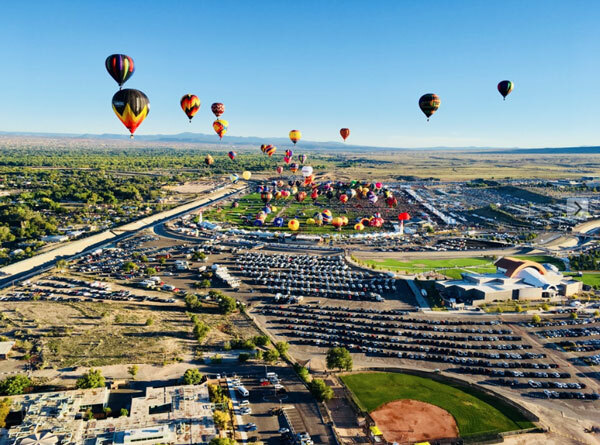 –Ticket info: Although you can enjoy seeing the balloons from almost anywhere in Albuquerque once they launch, it is super special to walk among them up close. 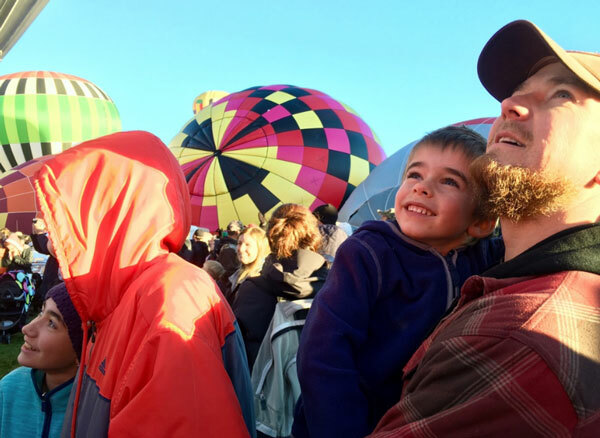 The charge to go onto the balloon field is $10/person (ages 13 and up) but thankfully kids 12 and under are free. You can get discounted ticket prices through the local Costco. Alternatively, if you know someone who is volunteering at the event, they may have access to deeply discounted ticket prices. -Plan on cold weather during the morning and evenings and consider bringing a lawn blanket if you wish to take in the views without having to do a lot of standing or walking around. -Still want to know more? 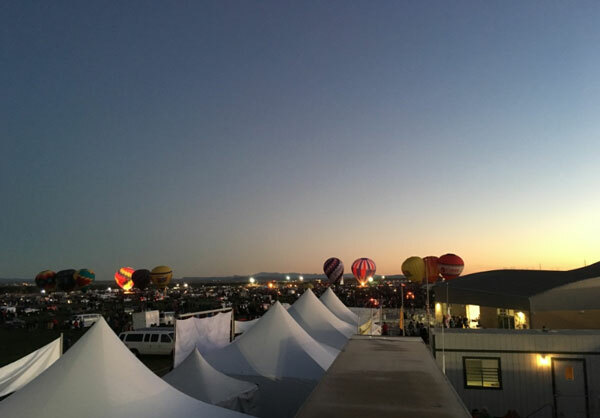 Click over to the FAQ page of the Albuquerque Balloon Fiesta website. -I’d love to share the video my husband put together of our experience. 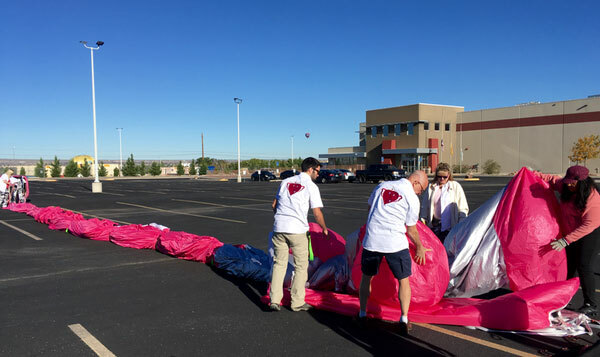 We cover costs to stay in an RV, volunteering as balloon crew and take you up in the balloon with us! Click here to watch. I think this article is my most favorite of your writings. Your descriptive words are masterfully used and paint such a vivid picture. After our visit that one afternoon/evening the girls and I were hooked! We really want to return and stay in the RV area. We have not been up in a hot air balloon and 2 out of 3 of us desperately want to. I, Katie, being one of them. Thanks for all the great info and tips on the event! I really hope FtF plans another hangout and that we’re able to be apart of it. 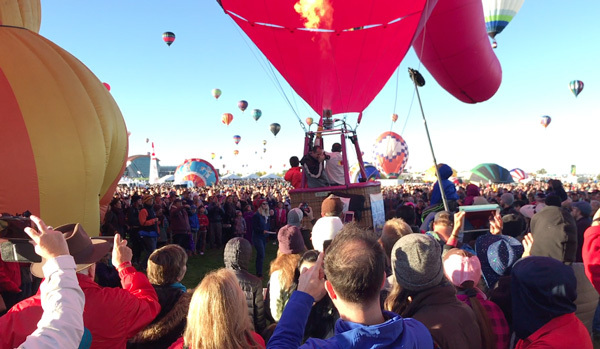 I am so very glad you guys got to wet your appetite for the balloon fiesta this year! If you are able to go again (for longer next time) you should totally consider crewing as that would be a great way to get a free ride. FTF had a good connection for that this year and Kimberly hopes to line up a second balloon for crewing in the future so even more people can help out. Great post! You captured it all beautifully!! So cool! I’m glad you had the patience to wait, you got the authentic hot air balloon experience. As always, beautifully written!